Palmerston North is a city in the North Island of New Zealand and the seat of the Manawatu-Wanganui region. Kick off your visit on the 26th (Wed): examine the collection at Te Manawa and then make a trip to The Square. To see other places to visit, reviews, more things to do, and other tourist information, read our Palmerston North tour itinerary planner . Auckland Central to Palmerston North is an approximately 6-hour flight. You can also drive. In December, daily temperatures in Palmerston North can reach 19°C, while at night they dip to 19°C. Finish up your sightseeing early on the 27th (Thu) so you can travel to Whanganui. On the 28th (Fri), contemplate the waterfront views at Virginia Lake, let little ones run wild at Kowhai Park, and then explore the activities along Whanganui River. To see traveler tips, more things to do, reviews, and more tourist information, read Whanganui online travel planner . Traveling by car from Palmerston North to Whanganui takes an hour. Expect a daytime high around 19°C in December, and nighttime lows around 19°C. 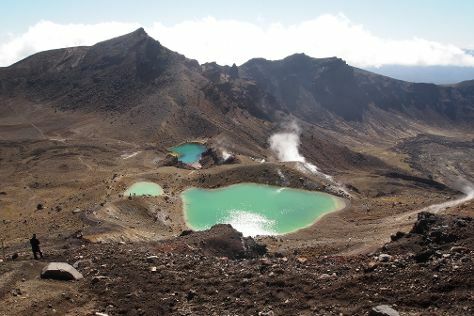 Finish your sightseeing early on the 28th (Fri) so you can travel to Tongariro National Park. Kick off your visit on the 29th (Sat): trek along Tongariro Alpine Crossing. Get ready for a full day of sightseeing on the next day: get impressive views of Mount Ruapehu, then trek along Taranaki Falls, then stroll through Whakapapa Nature Walk, and finally hike along Silica Rapids Track. For ratings, traveler tips, photos, and tourist information, refer to the Tongariro National Park day trip planning site . You can drive from Whanganui to Tongariro National Park in 2.5 hours. Wrap up your sightseeing on the 30th (Sun) early enough to drive back home.